Everything you need for a complete year of Elementary Greek. To play a sample, just click on the name. To download it to disk, Right-Click (PC) or Control-Click (Mac) and select "Save Target." 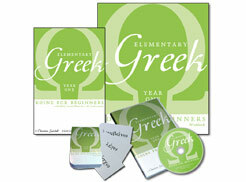 The complete Elementary Greek Year One course includes one textbook, one workbook, one teacher key, one test booklet, one audio companion, and one set of flashcards. Have more than one student? A whole family can share the texbook, and you just need to buy an additional workbook for each additional student in the same household. Finally, a Greek text that's both simple and substantial! Designed to be used as a full course for teaching children as young as 2nd or 3rd grade, Elementary Greek may also serve as a self-teaching program for teens and adults. No previous knowledge is necessary and each concept is covered thoroughly and reviewed regularly throughout the course. Thirty weeks of daily lessons in the textbook insure a complete school year of brief, incremental lessons with no additional planning. This non-consumable text is useable for all students in a family. Year One of this course introduces the Greek alphabet, basic vocabulary, grammar, and translation. Each student will require his or her own individual workbook, which provides practice and application at each step of the way. An audio companion CD is available to aid in pronunciation of individual letters, words, grammar paradigms and passages. The set also includes flashcards that cover every vocabulary word used in the text. • Packaged in a sturdy, protective plastic box suitable for shelving and easily found. Gerald R. McDermott is Professor of Religion and Philosophy at Roanoke College in Salem, Virginia. He is the author of numerous books including One Holy and Happy Society: The Public Theology of Jonathan Edwards (Penn State Press), Seeing God: Twelve Reliable Signs of True Spirituality (InterVarsity), and Cancer: A Medical and Spiritual Guide For Patients and Their Families (Baker Books). He also serves as Teaching Minister at St John Lutheran Church in Roanoke, Va.
Ian Bogost is Ivan Allen College Distinguished Chair in Media Studies at the Georgia Institute of Technology. He and his wife Abbey homeschool their two children. Ian studied comparative literature and philosophy at the University of Southern California, Cornell University, and UCLA, including classical Greek and Latin. He currently teaches and researches on the intersection between literature and digital media. He is the author or co-author of eight books.